Slots and table games provider Habanero has launched Jackpot Race – a new patent pending jackpot system which is shared among a pool of winners. The jackpot accumulates value and at a configured time the race starts, during which the jackpot must be triggered before the cut off time. When the pay-out event triggers, players who are actively playing are allocated winnings in order of the received bet on the server. Pay-outs are based according to the configurable prize pool. The Jackpot Race is fully customisable, allowing operators to tailor the parameters to suit their and their players’ needs. An operator can choose any number of slots to feature in the race, the duration of the accumulation period and race schedule, minimum qualifying bet size and the prize pool allocation. For example, an operator chooses six slot games and a three-hour race period commencing at 8pm on Friday night. 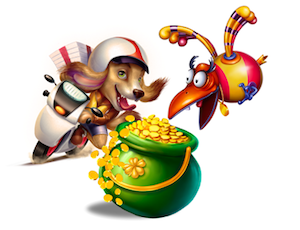 The jackpot will accumulate value from all play outside of the race period and during the race itself. At 8pm on Friday, the Jackpot Race will begin. Some time between 8pm and 11pm the pay-out event will trigger with the likelihood increasing towards the end of the race. Winners are paid out according to a pool such as 50 per cent for the 1st position, 30 per cent for the second position and 20 per cent for 10 additional places. Toni Karapetrov, head of corporate communications at Habanero, said: “We call it the Jackpot Race because it is both competitive by design, and because many players can win simultaneously on a split share of the pay-out.